Sisters. Sisters. There were never such devoted sisters. That’s how the Irving Berlin songs goes and, when I was little, I remember sitting on the sofa, watching White Christmas, and gazing up adoringly at my older sister Nicola and thinking that song was written about us. Weren’t we devoted? Of course we were! Didn’t we share everything? Absolutely. We were sisters – happy little sisters only three years apart in age and as close as close could be until…well, until I cajoled her in to letting me have her favourite dolly Michelle (Michelle? I know and I thought she was the most beautiful thing I had ever laid eyes on) for the night and one of Michelle’s eyes fell out. Nicola didn’t speak to me for weeks after that. Or maybe our relationship began to crumble when she was allowed a pony and I wasn’t and I harboured such a grudge that, years later, I took her favourite lipstick and smeared it all over the walls of her bedroom. Or did the problems begin when she had a boyfriend and I didn’t and I think I used to kind of flirt with him (poor bloke) in my own childish way..
Oh, sisters! What a tangled web we weave. Forget mothers and sons, father and daughters, it’s the relationship between sisters that is fascinating. Sisters can change the world. When we are good, united, pulling together, we are an unstoppable force. Look at the Middleton sisters. Would they, on their own, have made the Time top 100 most influential women in the world? Probably not. It’s the combination of them – with their conjoined serious/flirtatious double-act thing and their irrepressible rise to the top of society’s echelons – that makes them quite so powerful. They weren’t bred for it. They have willed it. And yet..and yet..anyone who has a sister will tell you how fraught the relationship is. When we are in opposition to each other, we can bring houses down with the venom of our dislike. On the one hand, sisters are usually, on some level, utterly devoted to each other. This is the expectation of sisterhood – you are both women! You have to pull together! On the other hand, we are all too close to each other for comfort. Sisters share a very strong bond – they belong to the same family and are of the female gender. This, in itself, provokes a very strong glue between sisters. How can brothers truly understand their sisters and vice versa? Sisters go through the same things together – adolescence, first boyfriends, choosing bras, sharing experiences of pretty much everything. Some sisters seem almost programmed to react to a similar set of circumstances in exactly the same way. My sister and I appear to be like chalk and cheese. She hasn’t had a career. I have. She is an ‘earth mother’, I’m not. She’s really nice to sad lonely hangers-on. I am impatient and dismissive. She gives time to everyone, saves lame ladybirds, rears tiny chicks by hand. I march onwards and upwards, inadvertently crushing everything in my path. But, when you look at our lives more closely, it is incredible how similar we actually are. We have both had lots of children. We both love the country. Our love lives have virtually mirrored each other’s. This means that, regardless of all our ups and downs – and there have been many – we have a real, true innate understanding of each other. And yet we have crashed and burned so many times. 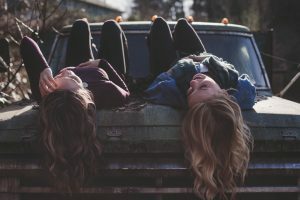 We have spent years not talking to each other – my mother stuck between the two of us, desperately trying to keep the peace as my sister and I have lobbed hurtful, painful insults at each other over a metaphorical wall. Sometimes I have been stratospherically insulting to her. She has bitten my head off at any given opportunity and yet, if anyone is rude about my sister, I’ll leap to her defence. I will bristle on her behalf, defend her to the hilt, take up my cudgel and wade on in. I have shouted at her, sworn at her and yet I’ve cried on her, wept on her like a baby, asked her to look after me, listen to me, help me. When the chips are down – we are truly there for each other. We are the best of friends, the worst of enemies. There is no one on this planet who drives me quite as mad as her and yet..she’s the first person I ring when I am in trouble. She’s right – there are countless example of sisters who indulge in a bit of healthy sibling rivalry, especially when it comes to the attractiveness stakes; Paris and Nicky Hilton are always posing together and yet, by their very natures, Paris is known more than Nicky because she is the most flamboyant. Vogue fashionista and author Plum Sykes is more widely-known than her twin sister Lucy despite the fact they both worked in the fashion business for years. Kim Kardashian is more famous than her sisters Kourtney and Khloe. This always seems to be the way; one sister rises higher than the other; the more flamboyant one garnering more attention than the sober-suited version – the good versus the bad, each sister being the flip-side of the other one, a female version of Jacob and Esau. Take Santa and Tara Palmer-Tomkinson. Blonde, beautiful, honey-skinned Santa is a longtime married – to historical writer Simon Sebag Montefiore – mother and novelist. Tara was naughty, outspoken, formerly wild, vulnerable and much-loved by the nation. Look at the Minogues. What do you do if you are Dannii? It’s impossible to outdo Kylie who is deemed to be a total sweetheart by everyone. She was Charlene in Neighbours! Danni didn’t stand a chance. But maybe it’s not as simple as that. Some sisters just simply don’t get on. Novelists and sisters AS Byatt and Margaret Drabble haven’t spoken in years and refuse to read each other’s books. It also doesn’t help when one sister in far more successful in their field than the other. Kristen Scott Thomas is renowned for being a great actress. Her sister Serena Scott Thomas, a former Bond girl, is almost forgotten about. Jackie Kennedy Onassis outshone her sister Lee Radizwell even though the latter was a Princess. My sister and I have actually flipped roles. As a child, she was more serious, more controlling, more disapproving than she is now. I was probably more rebellious, cheeky, naughty, fun and now, whilst still a touch of a rebel, my sister has become positively carefree. That serious little girl with the pursed lips has disappeared to be replaced with something far more joyous and vibrant. I’m the disapproving one now, always furrowing my brow, shaking my head, thinking ‘oh no!’ every time she rings me up to tell me a tale she finds hilarious and I find terrifying. When she told me she was pregnant with her seventh child, I almost dropped the phone in horror. We didn’t speak for ages after that. But once she had her beautiful baby Jack..I felt truly mean for being so disapproving of something, someone who is such a big bundle of joy. Who was I to judge after all? Well, I’m her sister. That’s the point of me, her, both of us. Sisters, Sisters. You’ll never find such devoted sisters.